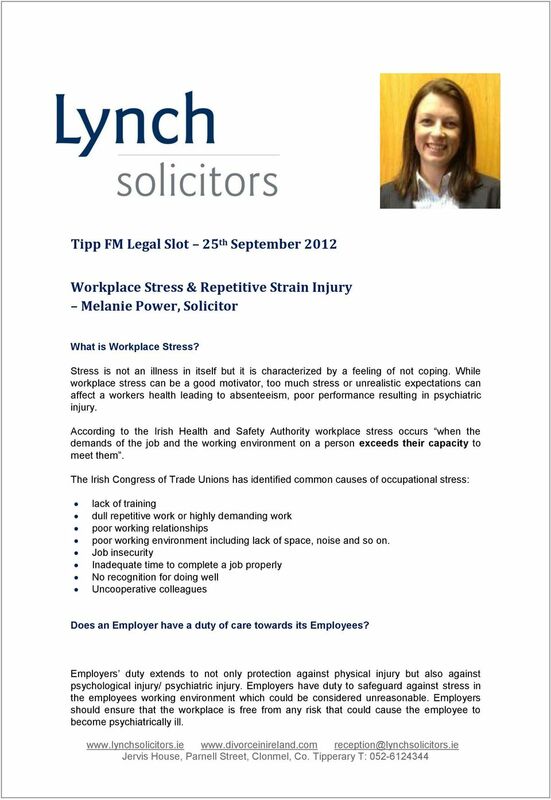 Download "The Irish Congress of Trade Unions has identified common causes of occupational stress:"
1 Tipp FM Legal Slot 25 th September 2012 Workplace Stress & Repetitive Strain Injury Melanie Power, Solicitor What is Workplace Stress? Stress is not an illness in itself but it is characterized by a feeling of not coping. While workplace stress can be a good motivator, too much stress or unrealistic expectations can affect a workers health leading to absenteeism, poor performance resulting in psychiatric injury. According to the Irish Health and Safety Authority workplace stress occurs when the demands of the job and the working environment on a person exceeds their capacity to meet them. The Irish Congress of Trade Unions has identified common causes of occupational stress: lack of training dull repetitive work or highly demanding work poor working relationships poor working environment including lack of space, noise and so on. Job insecurity Inadequate time to complete a job properly No recognition for doing well Uncooperative colleagues Does an Employer have a duty of care towards its Employees? Employers duty extends to not only protection against physical injury but also against psychological injury/ psychiatric injury. Employers have duty to safeguard against stress in the employees working environment which could be considered unreasonable. Employers should ensure that the workplace is free from any risk that could cause the employee to become psychiatrically ill.
2 Firstly, every employee has a contract and there is an implied term in every contract that you are treated with a certain amount of respect and that there is mutual trust between the Employer and Employee. If there is a breach of that duty there is a responsibility on the Employer. Take for example, an employee for an airline who is at a check in desk, delayed flights irate people, would the employee have a case of workplace stress? The Courts have applied a common sense standard which measures whether a certain amount of stress is part of the job. The EE should be given training in diffusing angry client. Where an ER is leaving an EE to deal with such a situation without the proper training on an ongoing basis this prolonged exposure to stress could lead to a psychiatric illness. What are the effects of Workplace Stress for Employers? 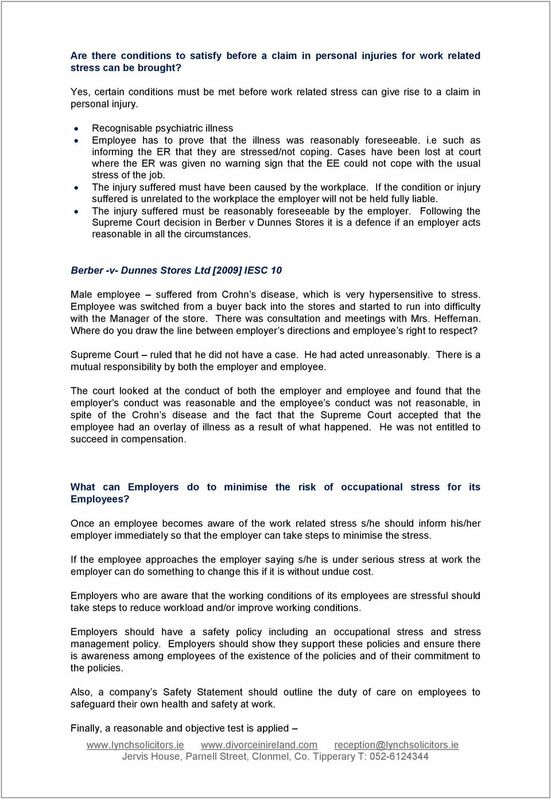 An employee s inability to relax or take a break can lead to burnout Low morale Increased absenteeism Higher accident rate Risk of legal action taken by employee(s) with occupational stress Is the sum awarded in compensation for occupational stress claims usually relatively small? Employment claims are proportionate the gross earnings and there is a limit on how much compensation can be made. However occupational stress claims are taken as a personal injury, which means the awards are unlimited. They are looked on no different than physical injury accidents at work. EXAMPLE Sweeney -v- Ballinteer Community School  IEHC 131 In March 2011 a teacher was awarded 88,000 by the High Court against the board of management of a school because of the school principal s deliberate and conscious bullying and harassment of her. The principal even hired a private investigator to follow her, which Mr. Justice Daniel Herbert said amounted to most serious harassment. Based on the evidence the High Court established that the teacher suffered psychiatric illness, clinical depression, arising from the continuous bullying by the school principal. 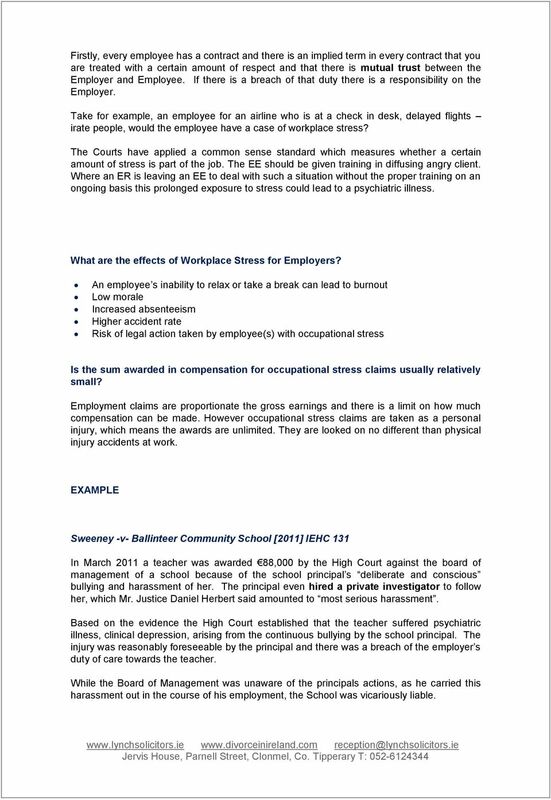 The injury was reasonably foreseeable by the principal and there was a breach of the employer s duty of care towards the teacher. While the Board of Management was unaware of the principals actions, as he carried this harassment out in the course of his employment, the School was vicariously liable. 4 An employer is entitled to accept what is on the face of it e.g. if an Employee is out on a sick cert due to back problems, the Employee cannot, four years later if s/he is out by reason of stress, say then that it was down to stress not back problems. Similarly, if an Employee says s/he is ready to return to work the Employer is entitled to accept that at face value. Repetitive strain injury Repetitive strain injury, or RSI, is an umbrella term used to describe work-related musculoskeletal (muscles, tendons, ligaments, cartilage, bone) disorders affecting the neck, shoulder, arm, wrist and hand. It is often used very loosely to include conditions that are not necessarily related to repetitive strain such as carpal tunnel syndrome or tendonitis (inflamed tendons). What causes RSI? However, the most obvious cause of RSI is repetitive movements, which can cause inflammation of the tendons (the tough tissue that attaches a muscle to bone) of the hand or forearm. This is particularly true if the movements are carried out in an awkward posture and without suitable rest periods. 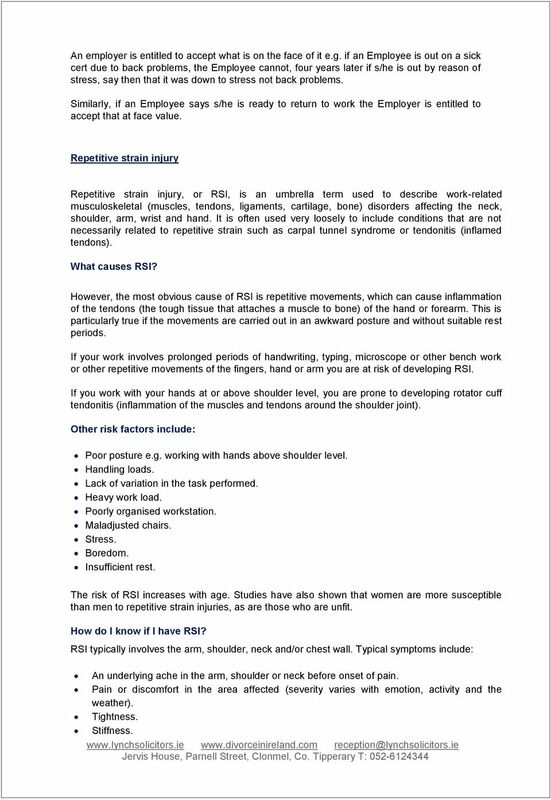 If your work involves prolonged periods of handwriting, typing, microscope or other bench work or other repetitive movements of the fingers, hand or arm you are at risk of developing RSI. If you work with your hands at or above shoulder level, you are prone to developing rotator cuff tendonitis (inflammation of the muscles and tendons around the shoulder joint). Other risk factors include: Poor posture e.g. working with hands above shoulder level. Handling loads. Lack of variation in the task performed. Heavy work load. Poorly organised workstation. Maladjusted chairs. Stress. Boredom. Insufficient rest. The risk of RSI increases with age. Studies have also shown that women are more susceptible than men to repetitive strain injuries, as are those who are unfit. How do I know if I have RSI? RSI typically involves the arm, shoulder, neck and/or chest wall. Typical symptoms include: An underlying ache in the arm, shoulder or neck before onset of pain. Pain or discomfort in the area affected (severity varies with emotion, activity and the weather). Tightness. Stiffness. Aching arms (or RSI) in small businesses. Is ill health due to upper limb disorders a problem in your workplace? Do injuries have to happen? Beware! your mouse can bite your hand! MUSCULOSKELETAL DISORDERS IN SONOGRAPHERS: ARE WE DOING ENOUGH? Disease/Illness. 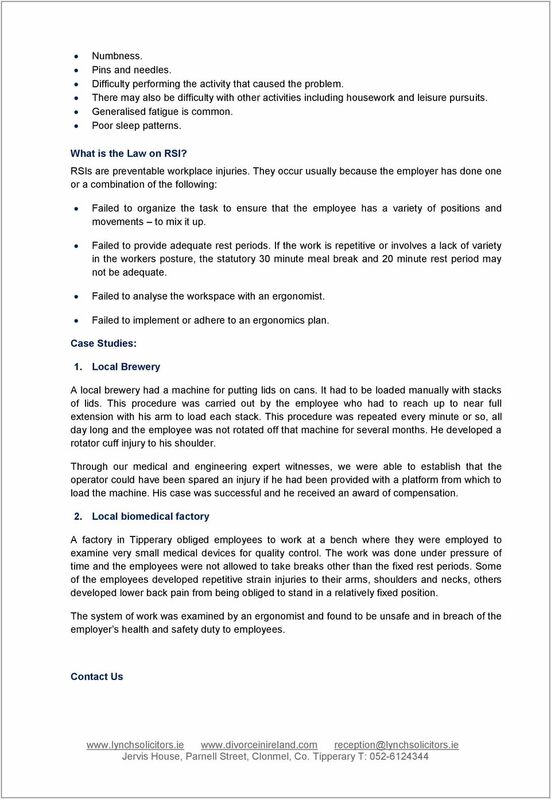 GUIDE TO REPETITIVE STRAIN INJURIES Repetitive Strain Injuries/Work Related Limb Disorders. Help it hurts! How does it happen? Lean-Ergonomic methods to reduce workers compensation costs (Part 2 of 2) Cumulative trauma disorders can be classified as: What is CTD? 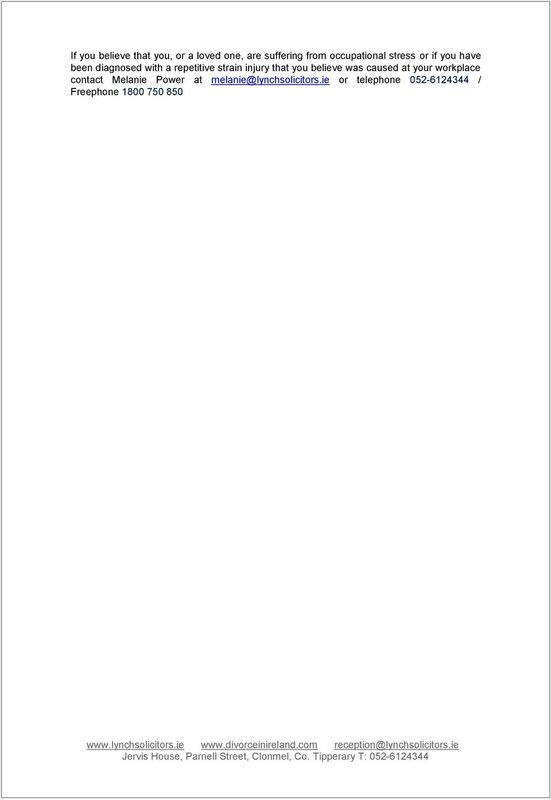 Did the worker s right hand condition arise out of and in the course of her employment, or was it due to the nature of that employment? X-Plain Preventing Injuries at Work Through Ergonomics - Cost-Benefit Analysis Reference Summary Introduction Ergonomics is the science of designing a safe, comfortable, and highly productive workplace. These notes are designed to be used in conjunction with the Moving and Handling PowerPoint slides. CORE SKILLS FRAMEWORK MOVING AND HANDLING PRINCIPLES FOR STAFF: LESSON NOTES & TIPS FOR A SUGGESTED APPROACH These notes are designed to be used in conjunction with the Moving and Handling PowerPoint slides.